Last week something got Star, one of my roosters -- the trail of feathers led off into the woods for about 200 yards, indicating that the bird fought hard. In the process, he saved his flock, because all the other chickens got back inside the coop safely. I suspected the predator might have been a neighbor's dog - -but I was wrong. ﻿ The next day, there was a flock of crows making a HUGE ruckus back there in the woods, accompanied by a chorus of blue jays. I went to investigate, and got a glimpse of a red fox running up the hill. No doubt in my mind, he (or she) is the chicken thief. And maybe a goose thief, too -- a female goose named Sarah has been missing for 2 weeks, although I did not find any of her feathers scattered like I did those of the rooster. Usually when there is a predator attack, it's really obvious, with tracks and feathers all over the place. I found none of this when she disappeared, so it is possible she is off somewhere sitting on a nest -- it has happened before. With all the tall grass around here, finding the nest would be next to impossible -- I'll just have to wait and see if she returns with goslings. Anyway, my chickens and geese now have to stay inside the coop or be penned up until this fox moves on or somebody shoots it. I myself do not hunt or trap, I prefer to live in harmony with nature, but it's times like these that remind me why I'm not a vegan. In fact, I have come to believe that veganism is an upper-middle-class urban phenomenon that does not work out when you actually try to live off the land. Don't get me wrong: I love animals, and as I have written before on this blog, I am an ovo-lacto vegetarian. But when things like this fox raid happen, I have to make decisions that are not always 100% pure ideologically. Do I let the chickens run free and take their chances? That seems irresponsible, now that I know the fox is hunting here. Do I keep the birds shut up safe inside the coop or in cages? That's not politically correct according to the animal rights people. Do I shoot or trap the fox? Wait until somebody else does it? That's not vegan, either. 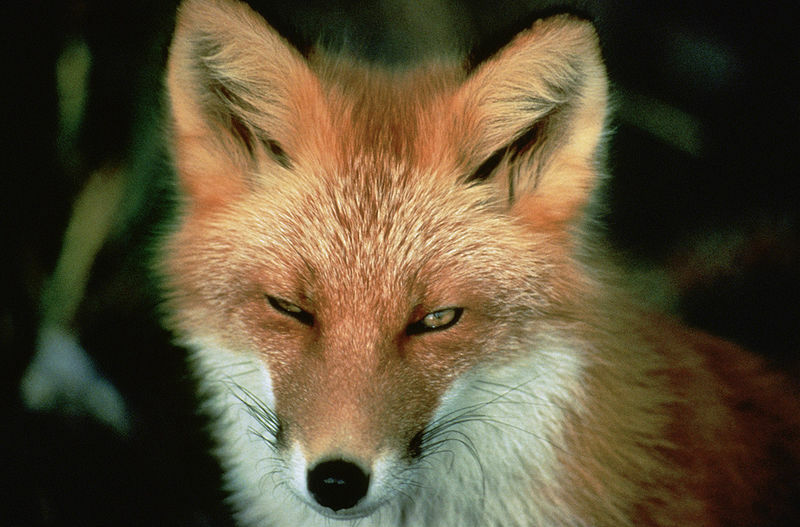 The fact is, there is no solution that does not, in some way, "oppress" either the chickens or the fox. So I have opted for confining the chickens. I figure they would rather be alive in the chicken pen than dead in a fox den. Of course, most vegans would say I should not even have chickens in the first place. But as a vegetarian who eats eggs, I feel it is my responsibility to get them from birds who are well-treated. Certainly my chickens are happier than those on factory farms. And even if I did give up raising chickens, what about all the slugs, cabbage worms, beetle grubs, and other pests that eat my garden? Do vegans realize that the fruits and vegetables they buy in the store -- even the organic ones -- are produced by killing the insects that feed on them? Believe me, I've seen cabbages that weren't sprayed with BT (an organic caterpillar killer) and they would never be deemed acceptable in the urban market. So, I must admit, I have no qualms about throwing the pests over the fence into the chicken yard. They are, after all, the natural food of chickens -- who, because of the fox, cannot forage the bugs for themselves right now. That's not vegan for the bugs, but it's good protein for the chickens. I try to live in harmony with animals as much as possible, but there are times when, as I said, I must make these decisions. I do not fault my urban friends who choose to be vegan. For them, it works. But when you actually live with raw nature on a daily basis, you soon realize that the forest is not as idyllic as we would like it to be. On the one hand, it was thrilling to be able to add "red fox" to my list of animals seen on my land. But on the other hand, the critter is a darned nuisance who took one of my favorite birds. The bottom line is, this world is not the Garden of Eden. I sympathize with your plight Rooster. The beauty of nature does not preclude our having to take charge from time to time. Welcome to my blog. I agree, there are times when we must step in with some active management -- that's what stewardship really is. I haven't seen the fox again, although the crows were making another big ruckus this morning back in the woods. I can hear young fledgling crows calling, so that's probably why the flock is being so protective.